I’ve always been a big fan of the “two birds with one stone” motto, so that’s what I plan to do with this article. 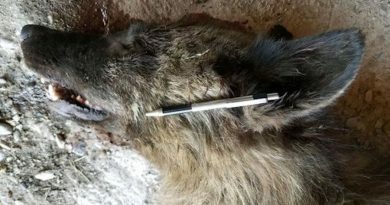 I’m going to answer both questions, as I attempted to hunt the same day I set up my Rhino-300. 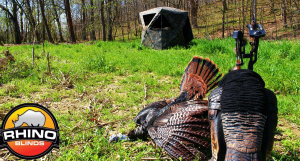 Efficiency make everything easier, and that certainly holds true for turkey hunting. Hunting in the Rhino-300 proved just that. 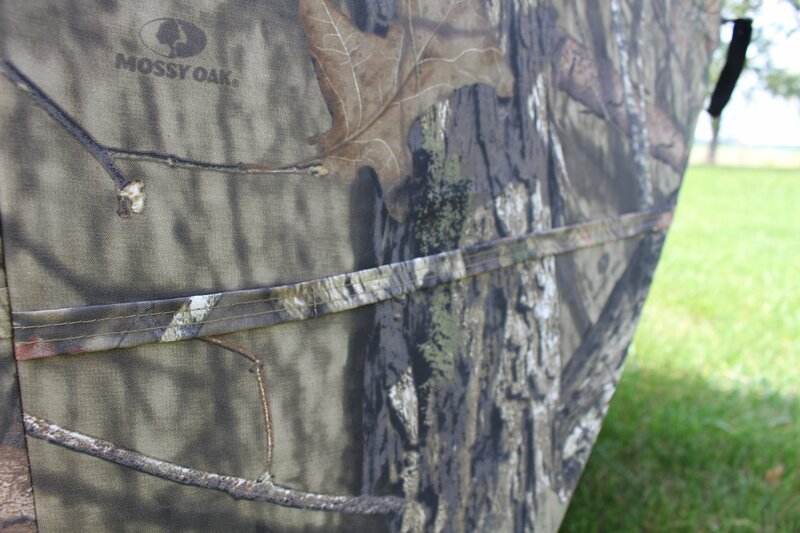 So if you set up a big, boxy blind, can you hunt from it the same day? Or, will turkeys need time to adjust to it? 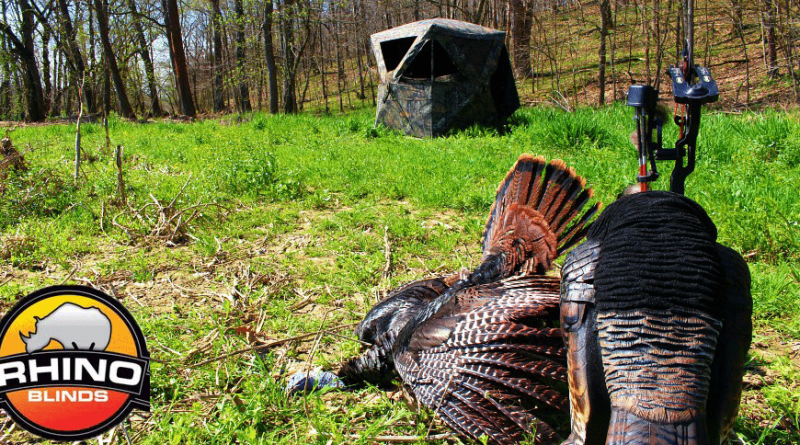 The short answer is YES, you can absolutely kill turkeys the day you put your blind up. I recently got to try my Rhino-300 during a turkey hunt and found success, thanks to pre-season scouting and a little bit of luck. I was running four trail cameras on different fields I knew turkeys had using. On my last camera check, I saw a nice tom using the edge of a field the morning before opening day in Illinois, so I decided he was my target the next morning! The alarm rang and I headed for the woods hoping to see the sun rise with the sound of gobbles in the background. I packed in my bow in one hand, my blind on one shoulder, my hunting bag with calls and camera equipment on my back, and my Dave Smith Decoys across my other shoulder. I made it to my destination and with the quick-and-easy setup of the Rhino-300 in the dark, I was ready for the gobbler to do his part. And, he did. Turkeys won’t mind a blind at all. 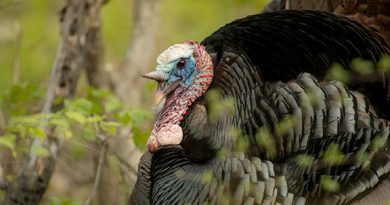 There’s no need to brush it in like you would for a whitetail, as you can place the blind out in the open and turkeys will still approach your decoys. 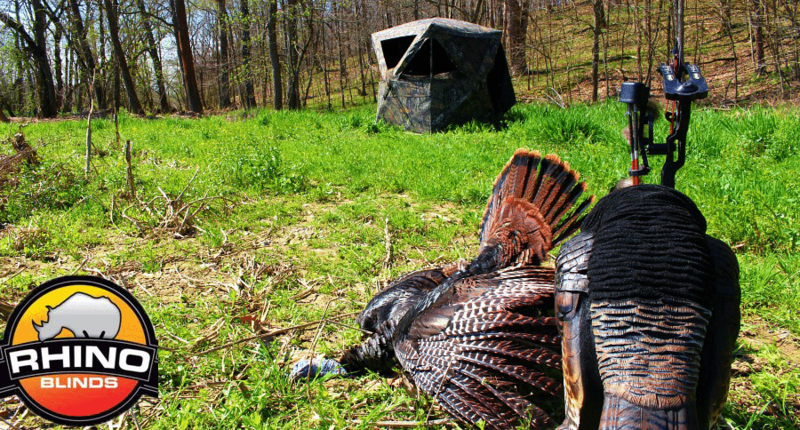 There’s no need to have the blind set up ahead of time, although it can make for an easier hunt. Get a blind that is light and easy to set up like the Rhino-300 and you’re good to go. Here’s a video of the hunt. 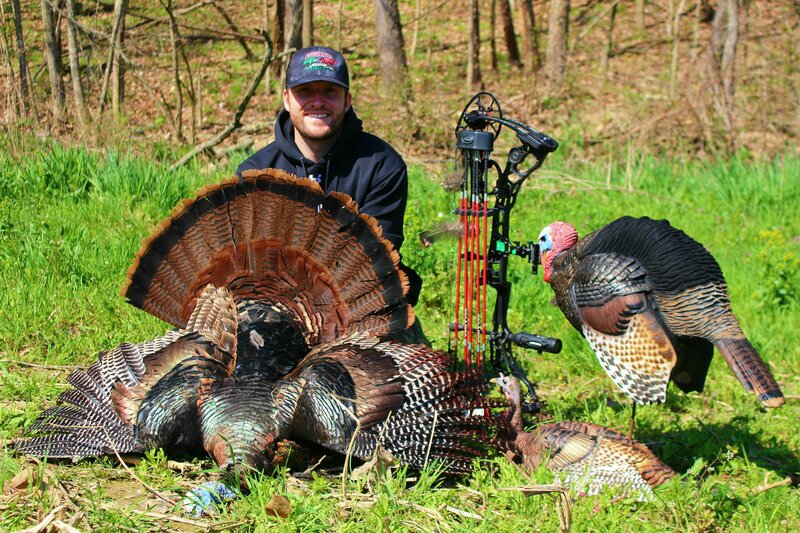 Not only was it a hunt I’ll never forget, but it’s completely changed my thoughts on turkey hunting with a blind and bow. Short video of a fun morning in the turkey woods. Drug the bow, decoys and Rhino Blind in on this morning and had some same day blind setup success. A blind doesn’t need to be brushed in or setup for a week for a turkey to feel safe unlike deer hunting.Ready for next season already. Rhino Blinds have solid quality products that are built with a hunter’s needs in mind and options that’ll fit any budget. I know I’ll be using the Rhino-300 a ton this fall during deer season. With a ton of different windows, and velcro, mesh, shoot-through windows at that, the 300 gives you a lot of different setup options. The actual blind windows are closed with clips, though, so you can quietly adjust mid-hunt if needed. The third picture down shows how the blind window closes. The size of the 300 is a great option for almost any hunting situation. The 300’s three-person capacity is accurate, as three people could hunt comfortably. But, if you’re going to be filming and moving equipment around, I would probably suggest limiting yourself to two hunters. The Rhino-300 comes with tie-down ropes, stakes and a backpack to transfer the blind from location to location. The backpack made carrying the blind super easy, and also had a zipper pouch on the front to store stakes and ropes. Shockingly, not many blind manufacturers have these on their carrying bags, but they make for a huge bonus in my book, as you never have to worry about forgetting or losing those parts. The next two things I want to hit on is what I really love about the Rhino-300 and Rhino Blinds in general. I honestly can’t believe blind manufacturers go through the production process and product development meetings without talking about these two issues. 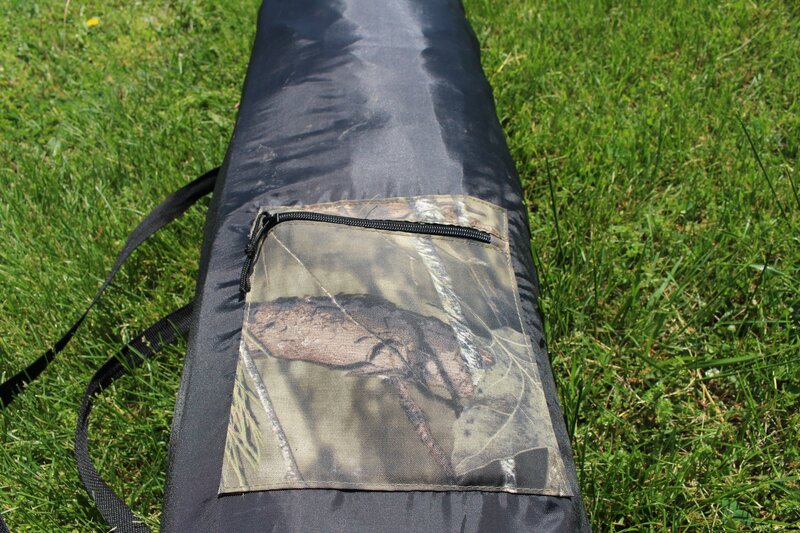 First, the Rhino-300 has brush straps running at the top of the blind, as well as the bottom, which is a necessity! My blind is covered with Mossy Oak Breakup Country camouflage, but these straps will allow me to use surrounding foliage to blend the blind into invisibility come deer season. Second is the zipper-less, velcro-less entry door to the blind. There’s nothing worse than quietly creeping to your hunting spot, meticulously stepping around twigs and brush, only to sound like a freight train ripping through the blind. 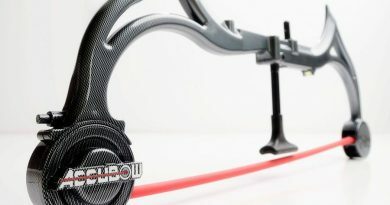 With the door on the 300, though, you silently unclip the door from the hub poles and detach the center buckle. Then, without a peep, you’re in and ready to hunt. In the picture above, you can see how the door attaches and closes. The craziest part, however, is undoubtedly the blind’s MSRP of only $169.99. At that price, this blind is an absolute steal in my mind when comparing it to other blinds I’ve hunted in over the past few years. The only thing I haven’t yet determined is whether the blind will hold up over multiple seasons of harsh weather. But, the material seems thick and sturdy enough to pass the test of time. 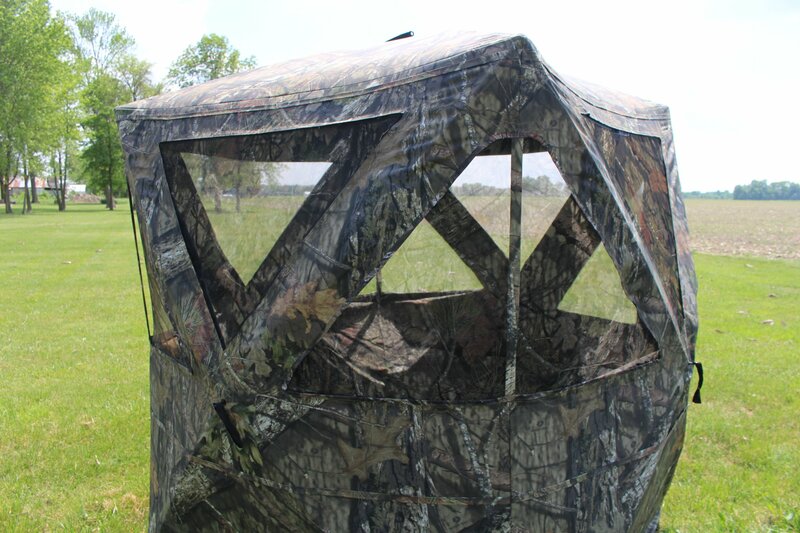 If you’re in the market for some new hunting blinds this fall, the Rhino-300 is a great option with a few features that fit the mold for what hunters really need in a blind. I hope you can hunt silently and effectively from your Rhino Blind this hunting season! The post Can You Kill a Big Tom if You Set Your Blind Up the Same Day? appeared first on Wide Open Spaces.